It makes an evening more romantic. It makes skin glow. It adds extra excitement to an already joyous occassion. Can you guess today's favorite thing? Its candles and candelight. As sad as I am that the days have grown shorter, I am glad for the longer evenings because that also means more time for the soft glow and flicker of candles. I love a mildly scented candle to increase the gentle assault on my senses. Two of my favorite new candle products are by Lucia and Woodwick. 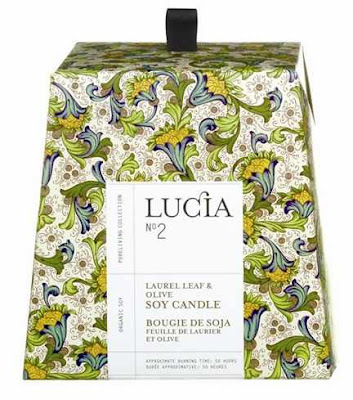 Lucia is a Canadian company, whose wonderfully scented candles are made with 100% organic soy. The scent that I am currently most in love with is the Laurel Leaf and Olive Oil, but there are many others in the line which my nose has ferreted out for future experiments. (Hint... there are goat milk soaps in matching scents. As an added bonus, the candles come so prettily packaged. Just the perfect thing to take along as a hostess gift, or if you want to treat yourself to the added pleasure of unwrapping a gift to yourself. 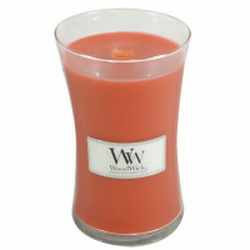 One of my other favorites are WoodWick candles. Not having the luxury of a wood burning fireplace, I picked up one of these to provide a lit fireplace ambience. By far the most intriguing feature of these candles is the wick, which if you look at the name you would surmise, is wood. I thin slice of wood provides a slow burning wick that has the added bonus of a slight hiss and pop of burning logs. For added effect, they have even managed to concoct a "Fireside" scent. Admittedly, this might be an acquired taste, but they have many other enticing scents as well. For this time of year, the Harvest scent is quite divine. If you have scent sensitivities, they also have an unscented candle so you can still enjoy the auditory excitement. Take advantage of the dark of winter and pull out a candle and indulge in the calming effects of candlelight.